Present state: The former down platform is partially extant as is the subway linking the two platforms. Notes: Dunstall Park station was on the Great Western Railway’s (GWR) Birmingham and Shrewsbury line. The section of line on which Dunstall Park was located was authorised as the Wolverhampton Junction Railway (WJR) in 1852 had opened on 1 July 1854 as a ¾ mile link between the Shrewsbury & Birmingham Railway (S&BR), and Cannock Road Junction which gave access to Wolverhampton Low Level station (opened on the same date). The WJR was a mixed gauge line (The GWR broad gauge of 7 feet ¼ inch and the S&BR standard gauge of 4 feet 8½ inch) when it opened but it was converted to standard gauge only in 1869. Originally the S&BR had opened to a temporary Wolverhampton station on 12 November 1849. They had been extended to run into a joint S&BR and London North Western Railway (LNWR) station on 24 June 1852 (which later became Wolverhampton High Level. There had, however, been disputes between the two companies and, as a result, the S&BR made a connection to the GWR. On 1 September 1854 the S&BR was merged into the GWR. Dunstall Park station did not open until 1 December 1896 by which time the line formed part of the GWR main line route between London Paddington and Birkenhead Woodside. Dunstall Park station was provided for local services. It was located only half-a-mile to north of Wolverhampton Low Level station, to the west of the LNWR main line which passed over the GWR route. Access to the station was from Stafford Road which passed under the line to the west of the station. The main entrance was on the southern side of the line, and from there a sloping path led to the down (Shrewsbury direction) platform. A subway led under the line and connected to steps that led to the up (Wolverhampton direction) platform. The down platform was longer than the up, extending further to the east almost to the LNWR line bridge. Its buildings were typical of GWR stations of the time. On each platform was a single-storey brick building with a hipped roof, and the window openings had segmental arches. Both buildings were provided with attractive wooden canopies. To the east of the down platform building there was a 19-lever signal box. The station handled parcels and horse boxes. Trains operated southwards from Dunstall Park to Wolverhampton Low Level and Birmingham Snow Hill and northwards to Wellington or Shrewsbury. The station was close to the Dunstall Park horse racing track and excursions visited on race days. 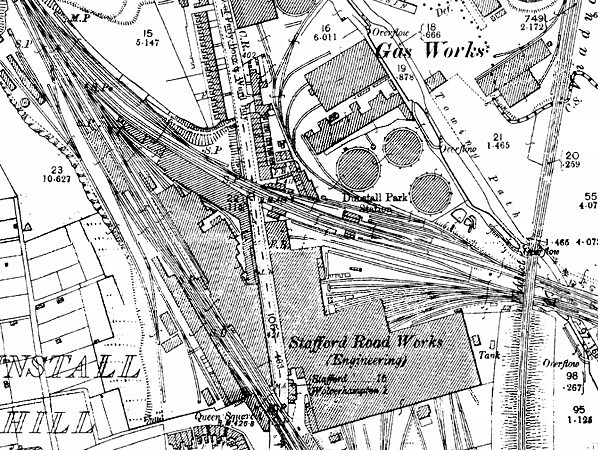 To the south-west of the station was the GWR Stafford Road Locomotive Works. The S&BR had established workshops as early as 1849. The WJR line had actually cut through the works and required demolition of buildings that had only recently been built. The GWR had extended the S&BR facilities into a large works. From 1859 until 1908 locomotives were built there and after that major overhauls and repair work was undertaken. The works employed hundreds of workers and many of them used the train to get to work. At the beginning and end of shifts Dunstall Park could be very busy. There was also a locomotive depot directly to the south of the station that dated back to the 1850s. On 1 January 1917 Dunstall Park was closed as a wartime economy measure, and it did not reopen until 3 March 1919. The July 1922 timetable showed 9 up and 8 down services Monday-to-Saturday as shown in the table below. There were no trains on Sundays. During the 1930s Dunstall Park was a busy local station mostly served by local Wolverhampton Low Level - Wellington trains. At nationalisation on 1 January 1948 Dunstall Park became part of British Railways [Western Region] (BR[WR]). The 19 September 1955 timetable showed 17 up and 15 down services on Monday-to-Friday. Most of the up services ran to Wolverhampton Low Level but there were four trains that ran to Birmingham Snow Hill. The majority of the down trains ran to Wellington but there were two trains to Shrewsbury, one to Chester, one to Welshpool and one to Cosford. On Saturday there were 17 up and 15 down trains. The extra up services ran to Wolverhampton Low Level. No trains called at Dunstall Park on Sunday. During the 1950s BR[WR] installed totem name signs and running-in boards. Diesel Multiple Units (DMUs) were introduced onto the local train services that served Dunstall Park from 1960. On 1 January 1963 all BR[WR] lines and stations in the Birmingham and Wolverhampton area – including Dunstall Park - passed to the London Midland Region [LMR]. BR[LMR] left the BR[WR] signs in place. In the Reshaping of British Railways (‘Beeching’) report of March 1963 Dunstall Park was not listed for closure. The Stafford Road Works however had already started to be run down as diesel traction replaced steam. The last locomotive was shopped-out in February 1964 and the works closed in June 1964 with the loss of 500 jobs. 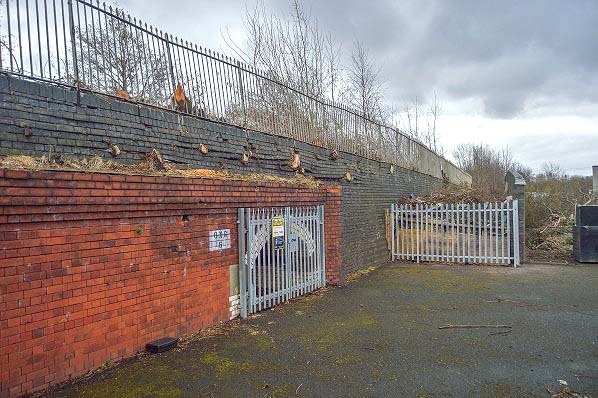 The closure of the works would have undoubtedly had an effect on Dunstall Park station. In 1965-66 there was an irregular train service throughout the day at Dunstall Park. 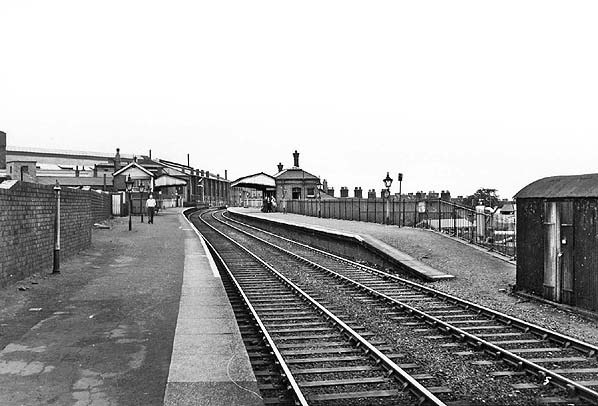 On 13 May 1966 a proposal was published to withdraw the passenger services between Birmingham Snow Hill and Wolverhampton Low Level line (not in Beeching’s ‘hit list’) as well as Dunstall Park; no other stations on the route to Wellington and beyond were included in the proposal. The connection between the S&BR line and Wolverhampton High Level had been taken out in 1859 when the GWR ceased to use that station (They had sold their half share in it to the LNWR). It was reinstated by BR[LMR] in the early months of 1967 so that trains to and from the former S&BR line could be diverted to run via the High Level station. After 5 March 1967 through expresses between London and Birkenhead ceased and other express and local services were diverted to run to Wolverhampton High Level. As authorisation to close Dunstall Park station had not been given by this time a passenger train service had to be provided. A handful of peak hour local services ran to and from Wolverhampton Low Level station so that Dunstall Park could be served. On 15 January 1967 the Dunstall Park signal box was closed. The March 1967 – May 1968 timetable showed only 4 westbound and 5 eastbound departures on Monday-to-Friday, confined to morning and evening rush-hours, with an additional early afternoon call in each direction on Saturdays. There was no Sunday service. On the 4 March 1968 Dunstall Park station was closed completely. Its buildings were demolished shortly after. 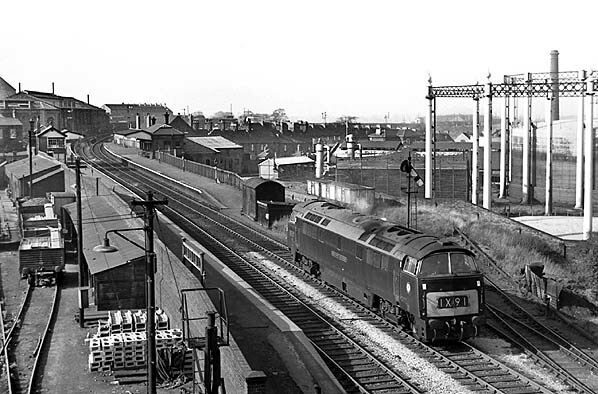 A few local passenger trains continued to travel through the station until 1969 after which they were diverted to run into Wolverhampton’s High Level station. On 18 January 1970 the section of line between Wolverhampton Low Level and Cannock Road Junction was closed and it was lifted shortly after. Despite the closure freight trains in the form of Merry-go-Round (MGR) coal services continued to pass through Dunstall Park station. The trains ran to and from the Ironbridge Power Station. The MGR trains had to perform a reversal at Cannock Road Junction when travelling in each direction. To save trains from having to carry out a reversal BR[LMR] opened the Oxley chord on 9 August 1983. The chord was a new section of double-track railway that commenced to the east of Dunstall Park station and curved northwards to create a link to the line to Bushby Junction. The opening of the chord allowed the section of line between Dunstall Park and Cannock Road Junction to close. Trains continued to serve Ironbridge Power Station until the departure of 4Z56, the Ironbridge Power Station to Tue Brook Sidings train on 12 December 2015. The train consisted of only a single wagon which was being recovered from the power station. After that train had passed through 55 minutes late very little traffic was booked to pass through Dunstall Park. By March 2016 very little remained of the station’s platforms but the down platform access path and subway were extant. 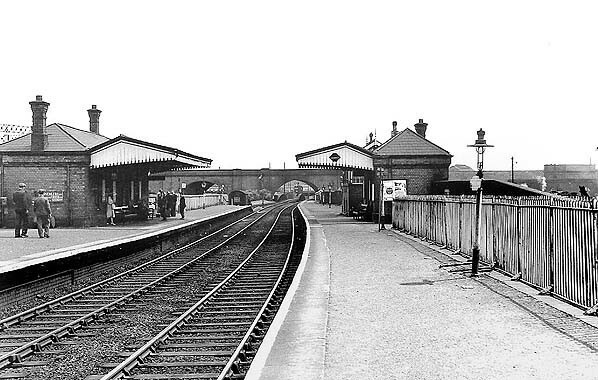 Looking east along Dunstall Park stations down platform in the 1950s. The up platform seen to the left appears to be busy with a number of passengers waiting to board a Wolverhampton direction train. Dunstall Park station shown on a six-inch scale map from 1903. The proximity of the Stafford Road Works is clearly illustrated. 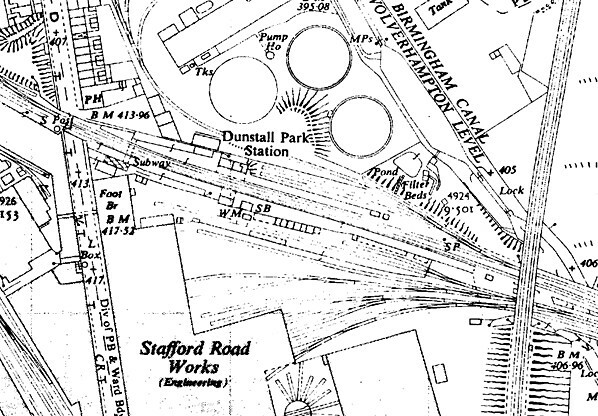 Dunstall Park Station as shown on a 1903 map. Dunstall Park Station as shown on a 1944 map. The goods yard is seen below the station with the weighbridge below the signal box. The station only had limited goods facilities handling parcels and horse boxes. 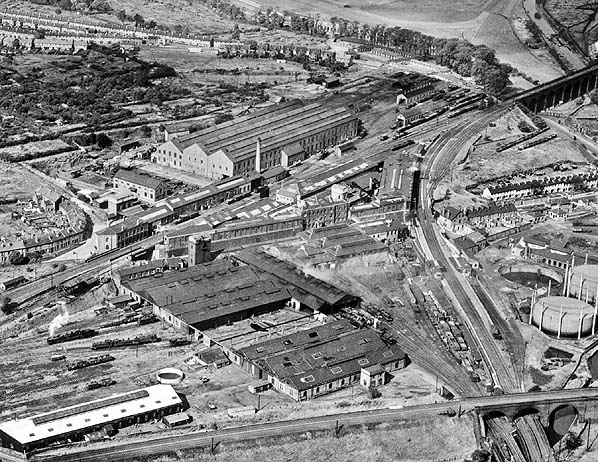 Dunstall Park station is seen to the right in this 1946 aerial view. The photo also shows the adjacent locomotive depot and the extensive Stafford Road Works. Click here to see a larger version. Dunstall Park looking west from the east end of the down platform in the 1950s. 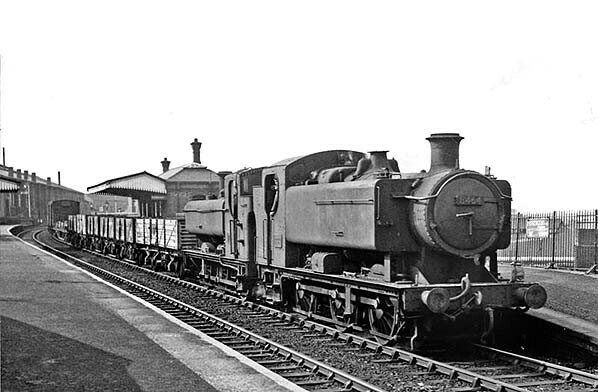 An up goods service is seen passing through Dunstall Park station in September 1962 on route towards Wolverhampton Low Level. The train was being hauled by '9400' class 0-6-0T No. 8464 which was built in October 1950. It would be withdrawn in December 1963. Behind the '9400' is an '8750' 0-6-0PT without number plates that was probably going for scrap. 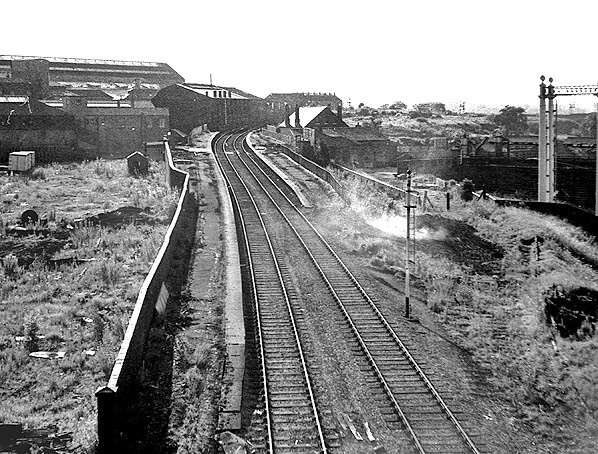 Dunstall Park station seen from the LNWR line viaduct in 1964. 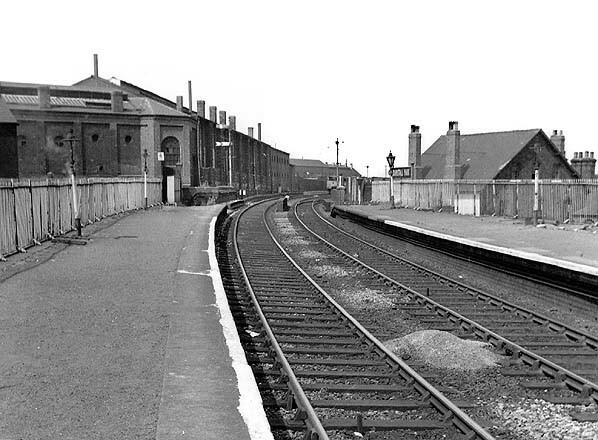 The western end of Dunstall Park station looking west from the down platform in the 1960s. Beyond the bridge to the left can be seen part of the Stafford Road works. Dunstall Park station looking west from the LNWR line overbridge in June 1969. The land to the left of the station was the loco yard of 84A Stafford Road Locomotive Shed. Beyond the shed site on the far side of Stafford Road are buildings of the Stafford Road Locomotive Works. Dunstall Park only had a small goods yard which was located to the right. The Dunstall Park down platform seen from the position of the station entrance on 3 March 2016. The red brick area seen to the left was part of the street level building. The subway which led from it to the up platform can be seen behind the metal gates. The sloping pathway that led up to the down platform can also be seen. Of particular interest is the GWR style railings at the rear of the platform.